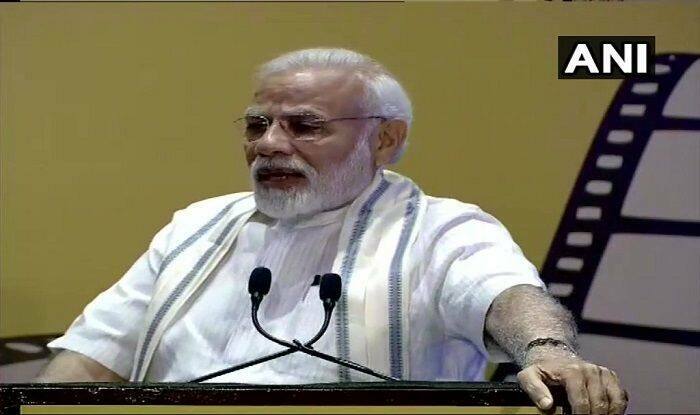 Mumbai: The medium of films is a “silent power” that can quietly influence the peoples thought process and contribute to bringing out major social changes and boost development in the country, Prime Minister Narendra Modi said here on Saturday. “How’s the josh,” the PM asked the audience “Uri” style as he inaugurated India’s first National Museum of Indian Cinema (NMIC) here. He said without the viewers even realising it, films change their thinking process, as movies and society are “reflections” of each other. “Films are identified with social changes… They have the knack to catch the future developments. Films help integrate our people who speak hundreds of different languages and thousands of dialects, the vastly diverse cultures, boost tourism in a big way and help generate employment opportunities, thus contributing immensely to the nation-building process,” Modi said. Moreover, he pointed out that Indian films represent the country around the world, show a ‘mirror’ to the people outside, helps improve our image globally, with our films, music, songs, stars creating a long-lasting impact in many countries. “Films also create hopes and aspirations among the people all over the country… Now, youngsters hailing from smaller towns or Tier II-III cities are emerging in a big way and creating waves in the film industry. Our strength is now coming out of such small places. This is a sign of changing times and society, problems are being portrayed along with solutions, obstacles are being removed, millions of problems have a billion solutions. We are not overawed by problems, but work to resolve them… That’s the determination of New India,” Modi said. He said that besides films, even Indian television serials like “Kyunki Saas Bhi Kabhi Bahu Thi” and “Ramayan” among many others are becoming very popular abroad where people have a desire for a glimpse of the common Indian’s life. Besides, he said films with social messages like the need for toilets can catch the popular imagination and many filmmakers are already making a conscious effort in this direction, plus science and development, integrating films and theatre and other aspects of modern times. The PM assured the government’s full support to strengthening the film industry, set up a university for films and entertainment, tweaking laws to tackle the challenges encountered by filmmakers including piracy, and the future of digital and social media vis-a-vis films. Earlier, he inaugurated the NMIC in the presence of a galaxy of past and present Bollywood personalities like Manoj Kumar, Aamir Khan, A.R. Rahman, Asha Bhosle, Pandit Shivkumar Sharma, Randhir Kapoor, Karan Johar, Madhur Bhandarkar, Kiran Shantaram, Boney Kapoor, David Dhawan, Rohit Shetty, Waheeda Rehman, Jeetendra Kapoor, Asha Parekh, Pankaj Kapoor, Rakeysh Omprakash Mehra, Parineeti Chopra, Divya Dutta, and many others in attendance. Maharashtra Governor C.V. Rao, Chief Minister Devendra Fadnavis, union ministers Rajyavardhan Singh Rathore, Ramdas Athawale, Shyam Benegal, Prasoon Joshi and other dignitaries were also present on the occasion.